>The time is arriving quickly. The participants are scrambling like mad to put the finishing touches on their shows for the 2nd Annual Pride48 live-streaming marathon. At 8pm EDT June 25th, they will start 48 hours of live shows for our entertainment. You will not only be able to listen – you can participate by joining in the chat room. The hosts will be talking back and entertaining YOU in this one-of-a-kind yearly event. Think of it as a global Pride Festival from the comfort of your house (or mobile device). Below is just a smattering of Podcasts that are participating…. All of these podcasts and more can be found in Itunes. >So where did I leave off since it’s been a few weeks. 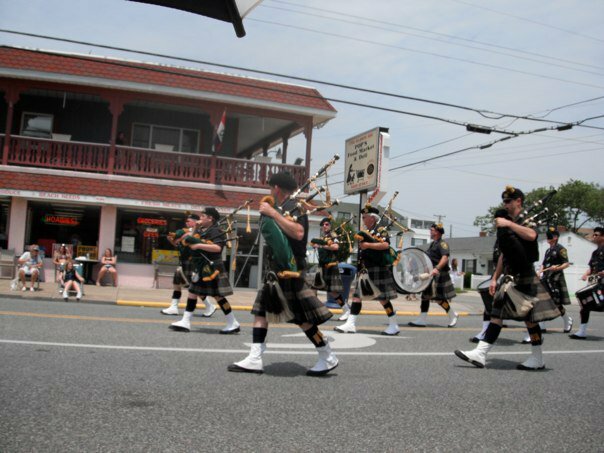 Since the trip to the Joisey Shore we have had 2 more parades. The first was a fabulous Wednesday night jaunt through the rain! You got it, we marched in the rain. The plus side was we led the parade so we spent less time in the rain than everyone else in the parade. That is the only plus! The next parade was an early saturday evening parade. This one we actually brought up the rear and was awful because it was stop and go. If there is anything I hate the most about a parade would be one that is stop and go. This past weekend we attended a picnic put on by our Doggie Adoption Group. The weather couldn’t have been more perfect. Warm, breezy, picture perfect. At the picnic one volunteer took charge and coordinated a Butterfly Release in honor of all the dogs who have gone on to the Rainbow Bridge. It was beautiful! Coming up is another parade tomorrow night. Then this weekend the hubby and I and 2 other friends will be visiting some other friends at their lake house. This looks to be a GREAT time. Nothing better than good friends, good fun, and a serene lake to swim in. Well must get back to the grind! 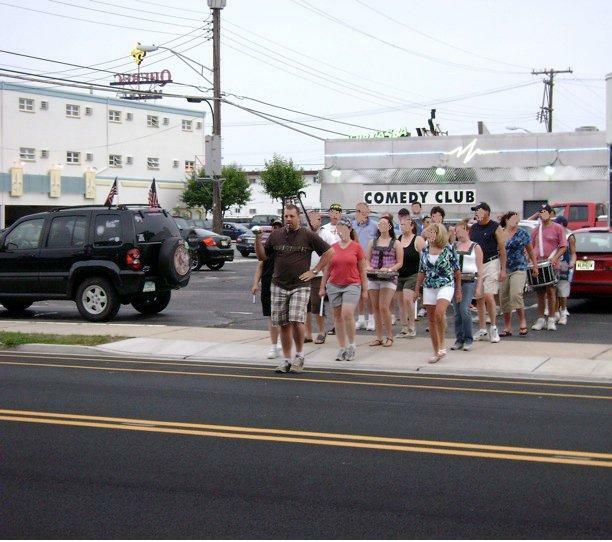 >So this past weekend the Drum Corps had a parade down on the Jersey Shore. The Hubby and I drove down Friday and stopped for lunch at our favorite travel spot Chik-Fil-A. We have to take advantage of it since there are none up yonder in the north. Once we arrived we checked in and got our fabulous room on the 3rd floor, and then proceeded to go for a nice swim in the pool. 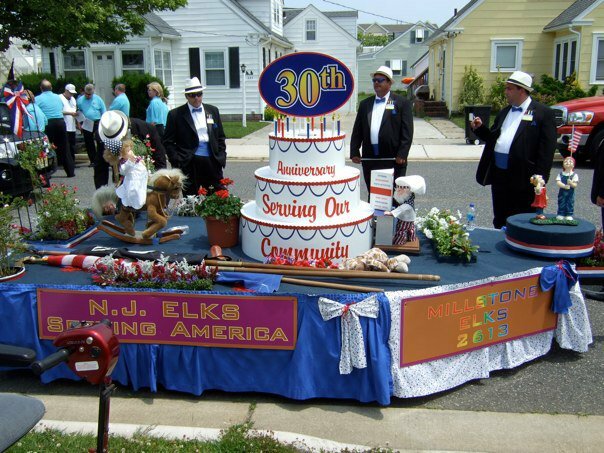 This is the float for the Elks Group we marched for. This is the cute guy who was the Head Elk for a different group. 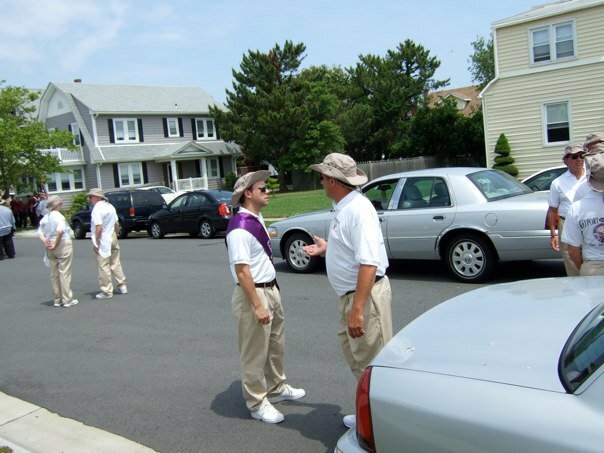 Here we are milling about prior to the parade starting. What parade isn’t complete without guys in Skirts blowing their bags! So finally it was our turn to head down the parade route. And man I must say we look damn sharp in our new uniforms. Just as an aside, I found out later in the night that we won First Place and the Elks we marched for won First place as well. After the parade we decided once more to take a nice dip in the pool, have some snacks, hang out and have a few drinks. Then it was nap time. 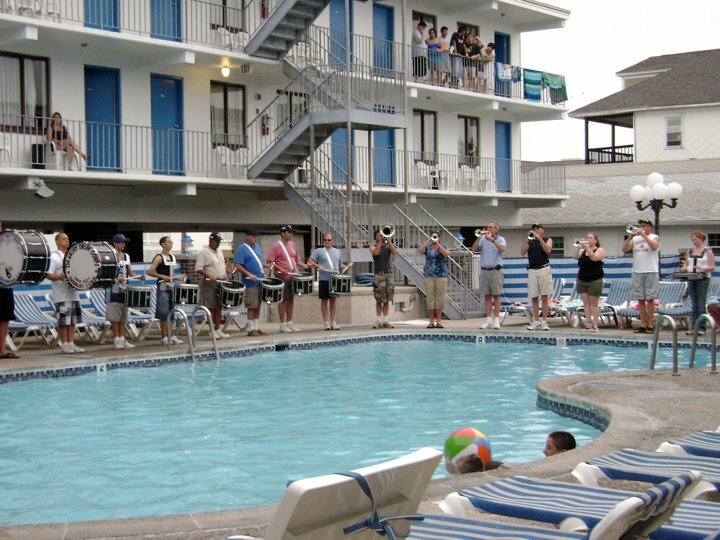 Later on into the evening the Elks we marched for invited us over to their hotel to play a few songs for them. Here we are getting ready to march across the st and play. 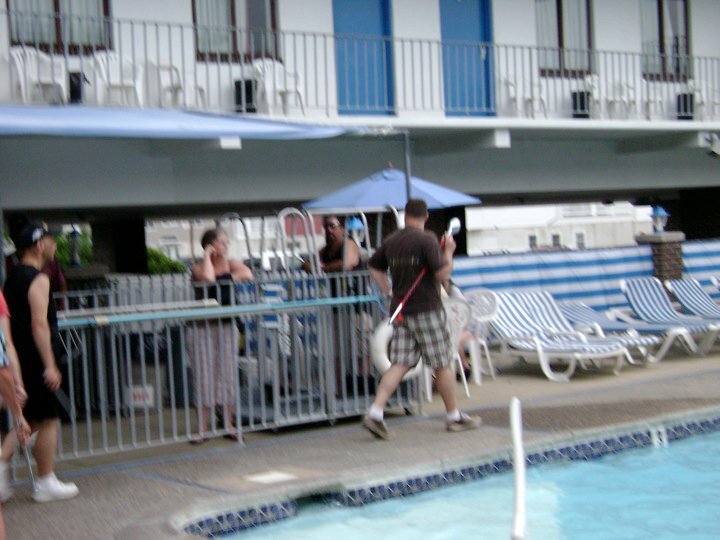 And here is me and my Big Stick Leading them in around the pool. 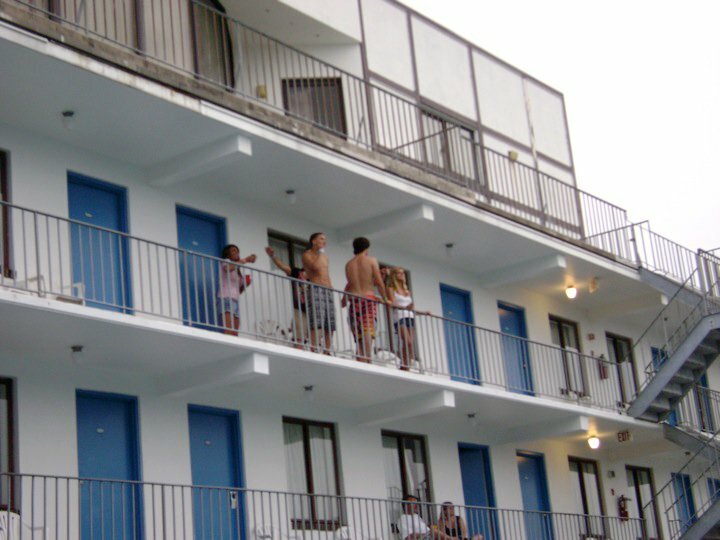 And last but not least here are the crazy shirtless guys who were dancing around their balcony as we played. Overall it was a great weekend. 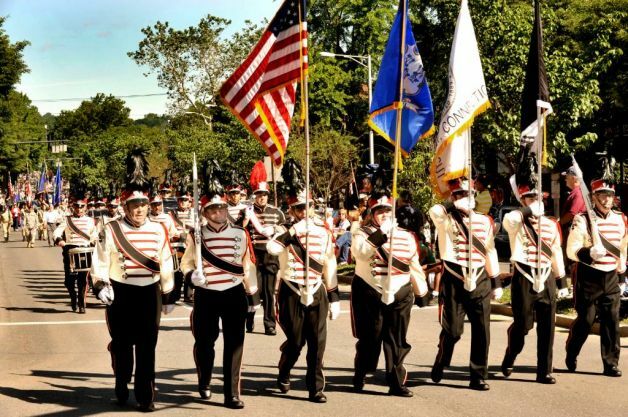 Up next this week are more parades (Weds and Sat) then Sunday we have a Flag Day ceremony to play at. >June is busting out allover! Well it’s Tuesday which means that the official start to Parade Season and the Unofficial Start to Summer have commenced. What a weekend. I feel like I’ve walked a thousand miles. In actuality I am guessing about 6-8 miles over the course of 3 parades in 2 days. 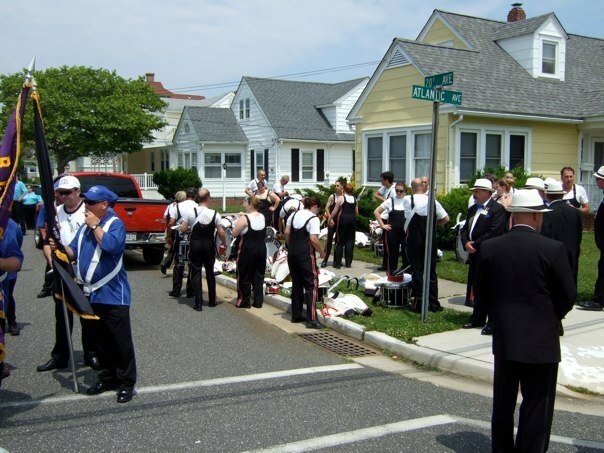 Sunday was the first parade of the Memorial Day weekend. Short jaunt through one of the local towns about 30 minutes away. Quick and easy and to the point. Then Monday were the Big one of the year and another little one. 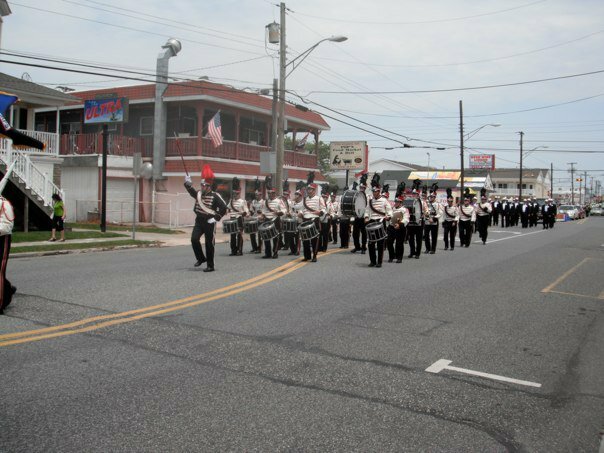 Every year the Drum Corps I belong to leads the Memorial Day parade in our hometown. This was my first Memorial Day as the Drum Major of the Corps and let me tell you it is an experience you can’t prepare for. This was also the first turnout with our New Uniforms purchased earlier this year. The weather was perfect and the crowds 6-8 deep in some places on the parade route. Here is a pic from the local Newspaper. After this parade we hopped on the bus and drove about 20 min to the next town over and marched in their Memorial Day parade. There were pluses and minuses to this second parade. The plus is it’s very short right down “Main St” and only 1 turn. The bad thing is every damn Cub Scout, Boy Scout, Brownie, Daisy, Karate, and Little League group was marching, behind us thankfully. After the 2 parades I went home to the hubby who had spent the morning after watching me in the first parade preparing for our BBQ and checkin on the meat he was smoking. We had a fabulous time with our friends and relaxing and eating and drinking and laughing. And as cold as the pool was at 76 degrees after all the work we did to open it I did go in with a couple friends. So let’s get this week moving cause Another parade ahead on Saturday and a weekend away is part of it.